Entries in the directory can be searched for and found using any LDAP client. Most clients provide some form of search interface so that the directory can be searched easily and entry information can be easily retrieved. Users cannot search the directory unless the appropriate access control has been set in the directory. For information on setting access control in the directory, see Chapter 13, Managing Access Control. With large directories, searching through every entry in the database for a search can seriously degrade overall server performance. While this can be alleviated somewhat through effective indexing, indexing itself introduces a performance overhead, and, in large databases, may still not reduce the search scope enough to improve performance. Reasonable limits can be set on user and client accounts to reduce the total number of entries or the total amount of time spent in an individual search, which both makes searches more responsive and improves overall server performance. Look through limit. Specifies how many entries can be examined for a search operation. Size limit. Specifies the maximum number of entries the server returns to a client application in response to a search operation. Time limit. Specifies the maximum time the server spends processing a search operation. Idle timeout. Specifies the time a connection to the server can be idle before the connection is dropped. Range timeout. Specifies a separate look-through limit specifically for searches using a range. The resource limits set for the client application take precedence over the default resource limits set for in the global server configuration. The Directory Manager receives unlimited resources by default, with the exception of range searches. For details, see the corresponding section in the Red Hat Directory Server Performance Tuning Guide. Browse the navigation tree in the left navigation pane, and double-click the user or role for which to set resource limits. 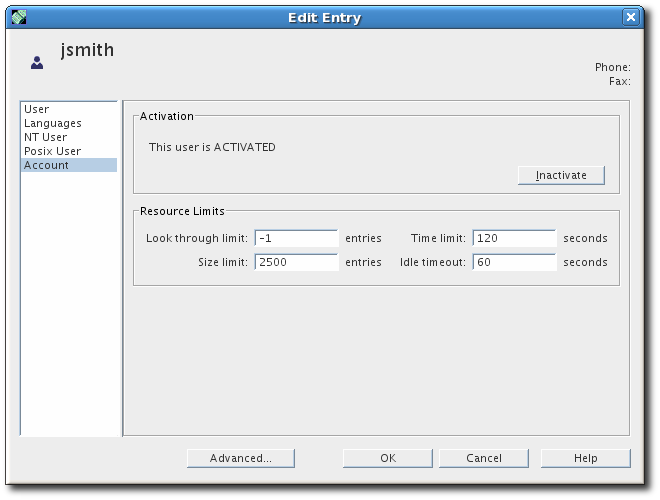 The Edit Entry dialog box appears. Click Account in the left pane. Look through limit. The maximum number of entries are examined for a search operation. Size limit. The maximum number of entries the server returns to a client application in response to a search operation. Time limit. The maximum time the server spends processing a search operation. Idle timeout. The time a connection to the server can be idle before the connection is dropped. Entering a value of -1 indicates no limit. More options are available when setting resource limits in the command line than through the Directory Server Console. The Directory Server Console sets user-level resource limits. Through the command line, administrators can set user-level resource limits, global resource limits, and limits for specific kinds of searches, such as simple paged and range searches. Section 9.1.3, “Overview of the Searching Algorithm” has more information on how these resource limits affect Directory Server search performance. Table 10.1, “Resource Limit Attributes” lists operational attributes which can be set for each entry using the command line. Use ldapmodify to add the attributes to the entry. User-level attributes are set on the individual entries, while global configuration attributes are set in the appropriate server configuration area. nsLookThroughLimit nsslapd-lookthroughlimit cn=config,cn=ldbm database,cn=plugins,cn=config Specifies how many entries are examined for a search operation. Giving this attribute a value of -1 indicates that there is no limit. nsPagedLookThroughLimit nsslapd-pagedlookthroughlimit cn=config,cn=ldbm database,cn=plugins,cn=config As with the look-through limit, specifies how many entries are examined, but specifically for simple paged search operations. Giving this attribute a value of -1 indicates that there is no limit. nsSizeLimit nsslapd-sizelimit cn=config Specifies the maximum number of entries the server returns to a client application in response to a search operation. Giving this attribute a value of -1 indicates that there is no limit. nsPagedSizeLimit nsslapd-pagedsizelimit cn=config As with the size limit, specifies the maximum number of entries the server returns to a client application but only for simple paged search operations. Giving this attribute a value of -1 indicates that there is no limit. nsTimeLimit nsslapd-timelimit cn=config Specifies the maximum time the server spends processing a search operation. Giving this attribute a value of -1 indicates that there is no time limit. nsidletimeout nsslapd-idletimeout cn=config Specifies the time a connection to the server can be idle before the connection is dropped. The value is given in seconds. Giving this attribute a value of -1 indicates that there is no limit. nsIDListScanLimit nsslapd-idlistscanlimit cn=config,cn=ldbm database,cn=plugins,cn=config Specifies the maximum number of entry IDs loaded from an index file for search results. If the ID list size is greater than this value, the search will not use the index list but will treat the search as an unindexed search and look through the entire database. nsPagedIDListScanLimit nsslapd-pagedidlistscanlimit cn=config,cn=ldbm database,cn=plugins,cn=config As with the ID list scan limit, specifies the maximum number of entry IDs loaded from an index file for search results, but specifically for paged search operations. nsslapd-rangelookthroughlimit cn=config,cn=ldbm database,cn=plugins,cn=config Specifies how many entries are examined for a range search operation (a search using greater-than, equal-to-or-greater-than, less-than, or equal-to-less-than operators). Giving this attribute a value of -1 indicates that there is no limit. The ldapmodify statement adds the nsSizeLimit attribute to Babs Jensen's entry and gives it a search return size limit of 500 entries. Resource limits are set on a user entry. An anonymous bind, obviously, does not have a user entry associated with it. This means that the global resource limits usually apply to anonymous operations. However, it is possible to configure resource limits specifically for anonymous binds by creating a template user entry that has resource limits, and then applying that template to anonymous binds. Create a template entry and set whatever resource limits you want to apply to anonymous binds. For performance reasons, the template should be in the normal back end, not in the cn=config suffix, which does not use an entry cache. For most users, the look-through limit kicks in and prevents range searches from turning into an all IDs search. This improves overall performance and speeds up range search results. However, some clients or administrative users like Directory Manager may not have a look-through limit set. In that case, a range search can take several minutes to complete or even continue indefinitely. It is possible to set a separate range look-through limit. This allows clients and administrative users to have high look-through limits while still allowing a reasonable limit to be set on potentially performance-impaired range searches. This is configured in the nsslapd-rangelookthroughlimit attribute. The default value is 5000, the same as the default nsslapd-lookthroughlimit attribute value.